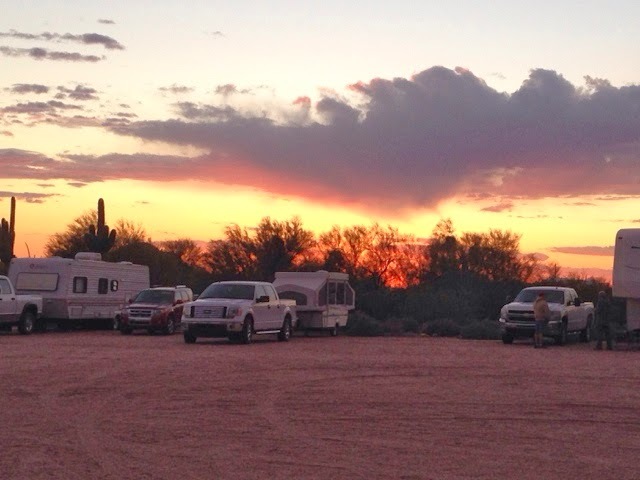 Dawn at the campground Friday. The sun is up on the other side of the mountain and we have to wait for it to get a awhile more for us to have sunrise. For most of my life I wasn't affected by seasonal alergies and now at home I get some runny nose in the spring and the fall. What I am experiencing here is a faucet for a nose. Every few days I need to buy more Kleenex. It is getting to be very frustrating and a bit of a sore nose. The allergy issue has been on TV here so it must be a general issue this time of year. Something to consider when coming to see the desert flowers in the spring. 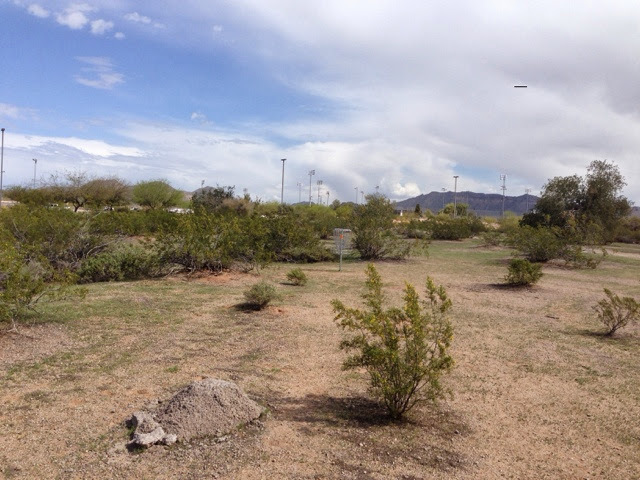 Today I decided to play at a disc golf course about 4 miles away in Mesa at Red Mountain Park. I got there and like many other disc golf locations in parks signage lacks unless a local league puts something up. In this cafe there was no posting on where it was in the park although the park has lots of signs. 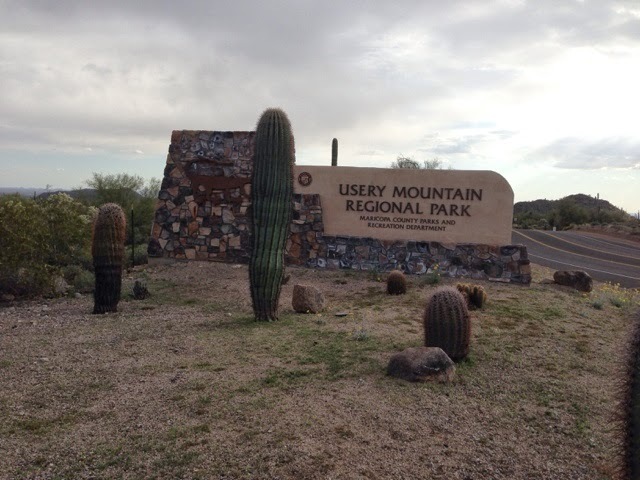 I was I luck as there was a Mesa Parks employee in county truck parked near where I was parked. I asked him where the course was and he describes that the course goes all around the formal part of the park and points to a big desert area saying there are many baskets out there too, He had no idea where the first tee was. But that was more information than I was going to find. I walked a bit and came across a nicely made cement tee box with no tee number. And with a tree behind it there was only one way to fly the discs, but where is the basket? It was nowhere in sight. It was all shrubs and small trees. I'm threw the disc but no basket to be found. I continued to walk and found another tee box like the last with a post with no number or information, but this time I can see a basket. When I got to the basket it was marked 13. I continued this way playing until I got to basket 18 and no more baskets to to found I walked back toward the camper. Ahead if me were two disc golfers finishing so I approached one as the other was just driving off. I asked for help on the course layout and the first tee. The man tells me how difficult the course was to figure out where the baskets were and recommended that I go online to find a map. He advised me that there were baskets that can't be seen from the tee. I had that part down already. He said once you figure out the layout it is a good course to play. He said look for arrows on the tee posts. I notice his shirt and he was a firefighter so we started a mutual conversation and discussed both our recent retirements. He retired after 30 years and appeared to be in his early to mid 50's. I discussed my trip that I am on after retiring. We both made comment on how different things are after retiring. 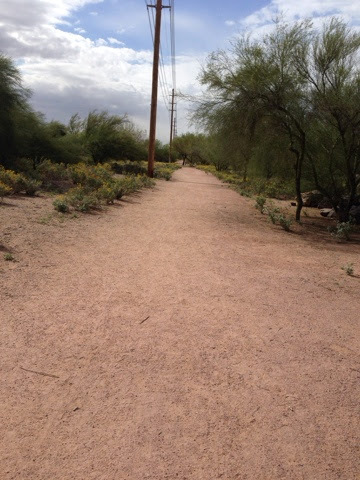 He was just leaving when I stopped him after play the disc golf. He and the guy he was playing with is is also a firefighter and still in the job at a station in Apache Junction, the next town over. He had wished that it had come to the course sooner that morning and I could have played with both of them and learned about the course. That would have been nice. He left and I wondered off in the direction he had sent me to find the first tee. I continued to play or should I say at this point practice throw as would throw in the general direction of where I thought the basket was and hoped I would find it. I eventually found basket #1 and this is how I played each of the front holes. I brought my hiking stick and used this to sweep out my disk from under brush as I had no idea what my be under the brush having seen the warning signs for poisonous snakes. I continued hunting for tee boxes and then throwing to the general direction of where I thought the baskets would be. There were just a few I could see from the tee box. As you can imagine I didn't keep score not finding all the tees and baskets. Come to find out they have a second 18 hole course on the south side of the park. A whole adventure awaits. If the course I played was marked well it could be a challenging course to play rather than the challenge it was to find the tees and baskets. After wandering and tossing discs it was time for a McDonalds stop and then on to the Cubs game at the new Mesa location of the team that is in a new ballpark. Mesa Riverview Park. As I crossed this intersection just after the light the blue sign says ball game sold out! I immediately went into Plan B mode and shuffled my papers and found that Los Angeles was playing at home in the other Scottsdale ballpark from the one I went to the other day. It was only 4 miles away too. I drove over there and when I got there was no organized parking and the traffic was gridlock. With no central parking lot like the other two parks people park where they can or possibly where they shouldn't and walk causing the gridlock as they crossed the streets. 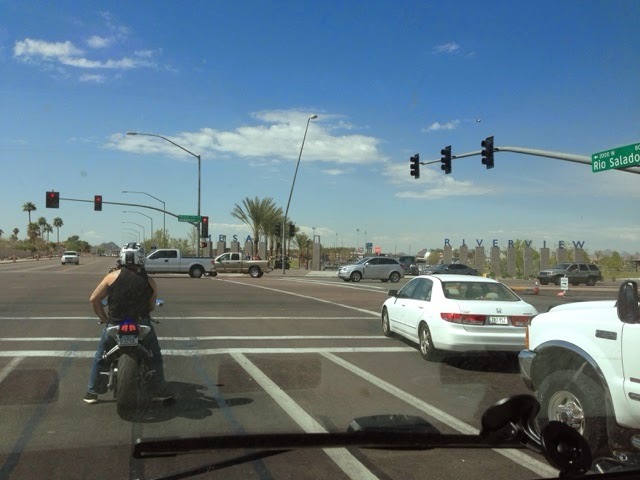 Note that when you have a green light and you arevturning right the crosswalk is active. With so many people that right turn lane never gets to move. Not wanting to continue my frustration I chose to work my way out of gridlock using the left lane and move my day on to on Saturday's chores today. I returned the camper power cord cover that I bought yesterday at Camping a World. It is the right item but it is a slightly shrunken version of what I currently have, so the three holes that are used to mount the new one don't line up with existing holes. I will need look to see if a company makes the one I have on my camper. I ran into a similar problem with a replacement cap for the water tank fill. The new cap is a hair smaller in diameter and fits so snug that I need to pry it off rather than unscrew it. The only way to fix that is to replace the entire fixture to match the cap or look to see if there is another company that makes one a different size. Replacing the entire fixture on either one means caulking replacement. 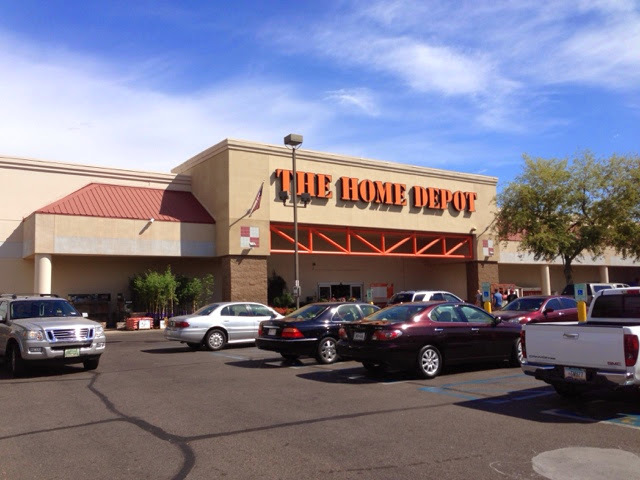 My next stop was Home Depot for a corrugated box and tape to send some things home. When I left in January I took too much clothing and I have not and will not use it all. I also brought a few things that will not be needed now on the trip. Together they filled a good size box. I brought box to the UPS Store and shipped and had them ship it home. This will make the second half of my trip less cluttered and with Brianna coming to visit tomorrow (Saturday night) more room for her. I made my way back to the campground for the last night. 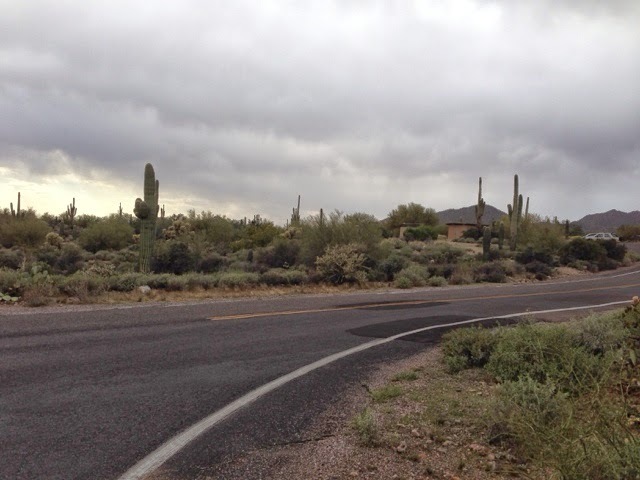 The upper level low pressure system was still kicking up some afternoon clouds and a few sprinkles in the east valley where I am staying. Regardless of a few sprinkles I decided to go on a bike ride before dinner. The county park where I am is large and has a number of roads that can be biked all on an incline as the park is on the side of thevhilly area. The main road that passes the park goes through a pass between the mountain I climbed the other day and the mountain with the arrow with the word Phoenix on it. I rode down the center park road and back up and then wanted to go further so I decided to ride on the main road to the top of the pass. 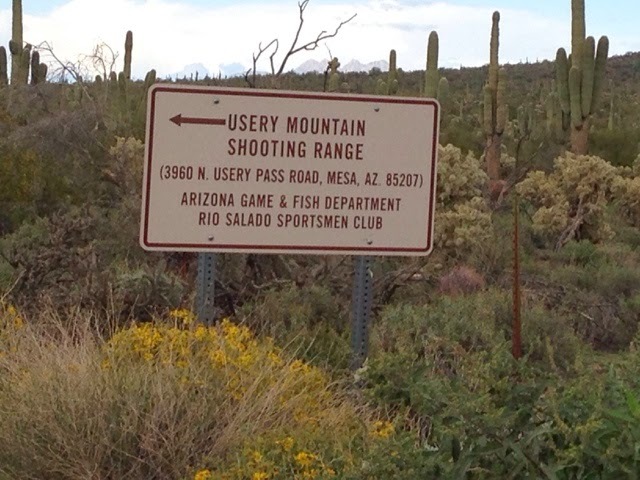 I did confirm that the shooting I heard during my hike up Usery Mt. Was from a gun range up at the top of the pass. This is a very big gun range and as with the other day there was plenty of shooting going on as I rode past. The nice thing about getting your exercise on a bike going up hill is that it is down on the way back. This is actually an excellent inclined hill the kind that has little changes in steepness so you can stay in one gear and develop a cadence like you would on a programmable stationary bike. When I got back to the campsite I made dinner, the last I will make for a few days as I will be staying in hotels for 4 days. Wow a plush bed is in my future. 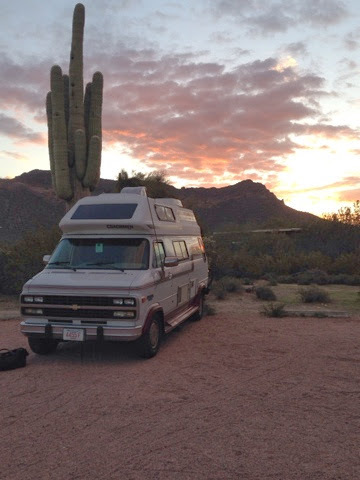 In retrospect it has been fine sleeping in the camper van as I have no problem sleeping on most surfaces. After dinner the ranger came by and asked me to move the camper as I was on the wrong side of the overflow site. I was parked correctly last night without knowing, but one of the drawbacks of having your camping be your transportation when you leave and when you come back someone may have taken the space you previously occupied. I didn't feel like leaving my folding chair set up to hold a spot and I really don't care about such details as I have an attitude that I will figure it out as I go. Apparently they have side A & side B to the overflow area and I needed to be on side A. I would have been there if they had told me but the ranger knew they hadn't told me when I checked in with them and was very nice about asking me to move. The park rented side B for a group and didn't want them upset that I was on their side. So I happly moved. I just need flat area or a slight slope so I found one. As an adjunct professor for Mount Wachusett Community College I heckled my college mail and one of my students for the online class I am teaching had taken his midte and then got locked out of the test having completed it but couldn't submit it. Friday evening I was trying to figure out how to solve this problem on the software the school uses (Black Board) for the online education. As adjunct we don't use the software very much and we don't ever use it enough to become proficient. Luckily. I don't have to try go do this off my phone, so I turned on my wireless hotspot (WIFI) and connected my IPad and worked on it and finally found, after an hour, where the instructor can accept a test and force submission on behalf of the student. While I was in the system I also graded the discussion board for the week. While I was doing this the simun was setting so I did get outside quickly for the sunset photo.